I read much about the industrial model of school still dominating school thinking and design today for many school systems around the world. But times have changed and many teachers working in schools know that our response to guiding the learning process for our students needs to change as well. The industrial model was for another time and another generation that will not continue to serve the current generation of students. There is an old joke about three professions, a Doctor, an Engineer and a Teacher, that get transported ahead in time 100 years from 1900 to the year 2000. The Doctor walks into a surgery and cannot believe the modern equipment, let alone how to use it. The Engineer sees the modern buildings and architecture and is totally a-gasp. Meanwhile the teacher walks into the classroom, picks up a piece of chalk and starts talking! There is an element of humour but I think also truth about this joke. There would be many teachers, possibly younger or older than me, who would have not modified their approach to teaching and learning in their entire career. Why is this so and how can it be allowed to exist in a world that has been rapidly changing due to the technology revolution occurring in the past twenty to thirty years? Students need to be taught CRITICAL THINKING and PROBLEM SOLVING today. Students should be ASKING QUESTIONS more than giving answers today. Schools should be thinking across systems rather than teaching SINGLE subjects today. Schools are not good at INNOVATION – in essence they are risk averse. CHANGE in education is REALLY HARD. Why? REFLECTION for students on their learning is as important as the time schools devote to traditional “learning time. Lichtman reflects on John Dewey’s model of Progressive Education and argues schools need to forgo the industrial model of schooling and return to the progressive era of essentially learning by doing. 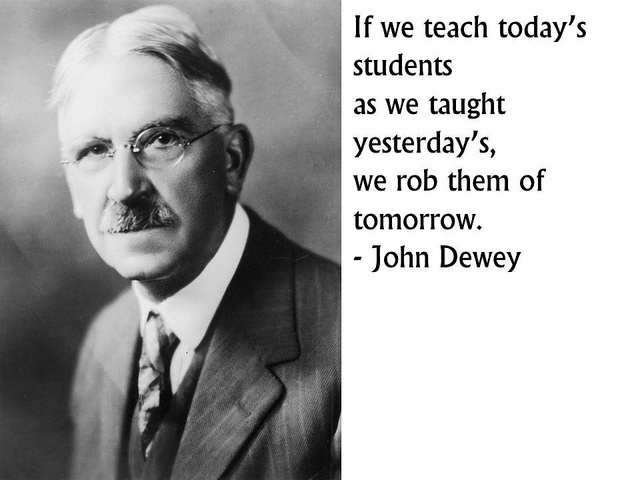 Dewey’s pragmatic and democratic approach to schooling may not stand out as radical today, but in the early and mid-1900s his view of education was in contradiction to much of the then-present system of schooling. Dewey’s approach was truly child-centered. A child-centered approach to education places the emphasis of learning on the needs and interests of the child. In Dewey’s view, children should be allowed to explore their environments. He believed in an interdisciplinary curriculum, or a curriculum that focuses on connecting multiple subjects, where students are allowed to freely move in and out of classrooms as they pursue their interests and construct their own paths for acquiring and applying knowledge. The role of the teacher in this setting would be to serve more as a facilitator than an instructor. In Dewey’s view, the teacher should observe the interest of the students, observe the directions they naturally take, and then serve as someone who helps develop problem-solving skills. (taken from Adam Jordan). He says INNOVATION is all about the future not the past so schools should focus on this guiding imperative to build the MODERN SCHOOL that is constantly adapting to the needs of students now and into the future and this means rethinking schooling and how we teach. A few weeks ago I was invited to participate in the Düsseldorp Forum and the Mitchell Institute’s Creative Collective, a new initiative designed to bring together a range of people from different backgrounds, who are interested in nourishing a creative society. To be honest, I was surprised to get an invitation, since I didn’t know any of the people from either of the two main organisations. It was nice to be included, however, and nicer to know a couple of the attendees. I like these quotes from Steve Jobs. Reading his biography by Jacobsen it also sounded like his achievements came at some costs. He sounded very driven and these quotes indicate that. He was all about building something great, leaving a legacy which we remember him every time we get the latest iPhone upgrade etc. but he also didn’t have time to tolerate fools gladly so his temper was apparently famous when things didn’t go his way. Is this acceptable in today’s management world? I think he certainly appreciated the value of time and squeezed much into his life. I often wonder how his children turned out and what sort of people are they? 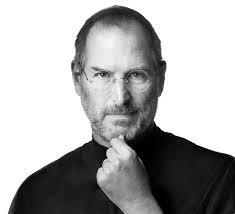 Maybe we not only need to look at people like Jobs from the success angle but what can he teach us about values? Certainly an interesting individual and a huge legacy. Thanks our sharing. “Fact: Steve Jobs didn’t become successful overnight. You can click the link above to read the entire post. Another fact is that Steve Jobs has so many impactful quotes attributed to him. I decided to pick my top five from Russell’s list for this week’s Five Friday Faves. What are your favorite Steve Jobs quotes?